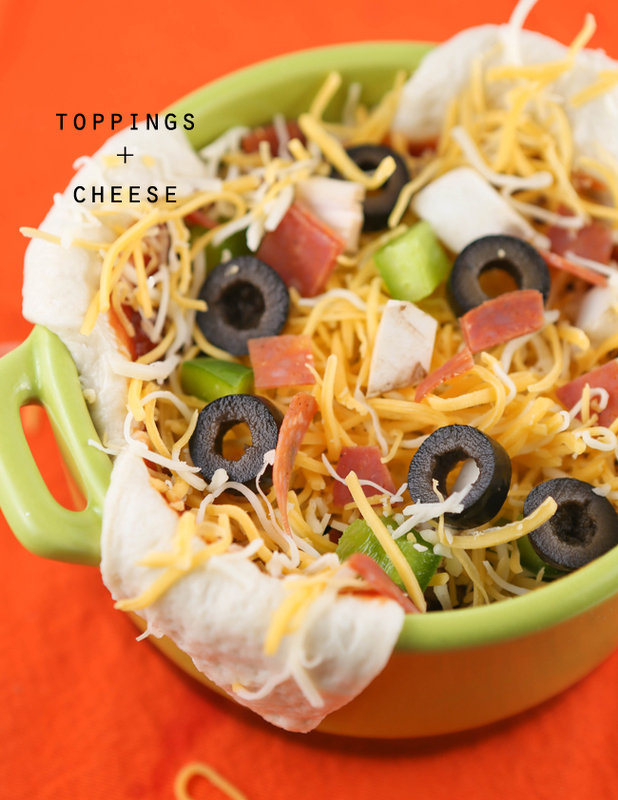 Pizza Bowls ("Interesting Pizzas") — Pip and Ebby - easy, delicious recipes! Pizza Bowls - a new way to enjoy pizza! Personal pizzas eaten with a fork! Fun alternate option for pizza night. The post-surgery fog is lingering. Things aren't clicking at a usual pace and I have been mindlessly forgetting appointments and other scheduled events. If I have blown you off in the past week, I kindly ask your forgiveness. 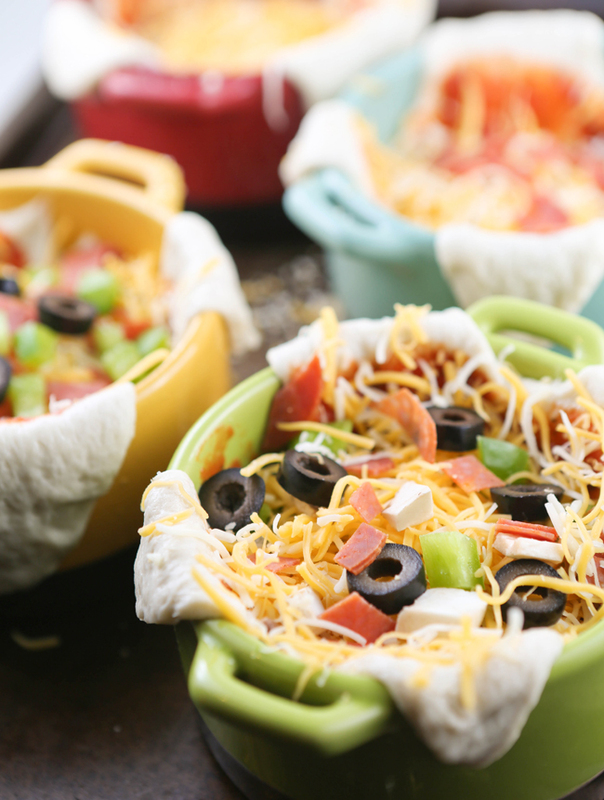 It's a miracle I came up with the idea for these delicious little pizza bowls the other day. I said to the boys, "I have a dinner idea for tonight that I think you are going to LOVE!" Without skipping a beat, Elijah said back to me, "Are they Interesting Pizzas?!" He does that every once in a while. He pulls things right out of my head. He nailed it. They are indeed interesting pizzas. He made me promise I would include that in the title. Ramekin bowls work perfectly for this recipe, but any oven-safe bowl will do. Coat them generously with cooking spray. 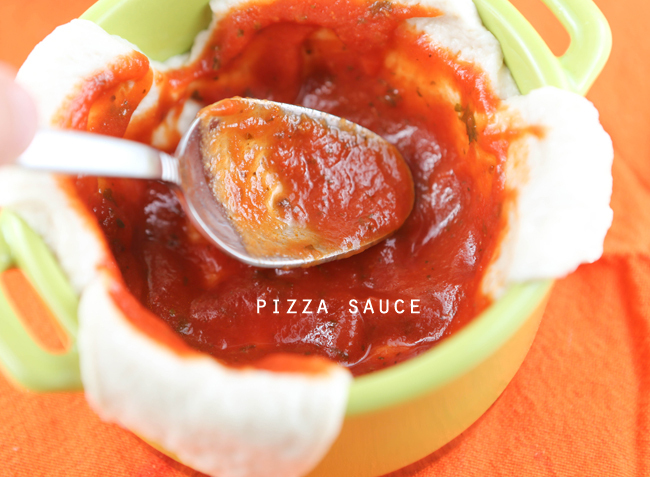 Watch this video to see how easy it is to make your own pizza sauce! Cut a rectangle of pizza crust dough (the refrigerated variety works great) into four equal pieces and press into the prepared bowls. Press down with your fingers a little bit extra on the bottoms, as this part won't cook as quickly as the outsides. Other great options for pizza night: Pull-Apart Pizza Ring, Meaty Skillet Calzone, Angry Birds Pizza and this delicious Spinach Artichoke Flatbread Pizza! Smear a little pizza sauce along the bottoms and sides. Add toppings of choice and cheese. The more toppings you pile on, the longer the cooking time will be. My loaded ones took somewhere between 17-20 minutes and the ones with just a bit of pepperoni and cheese were done in 15 minutes. We loved these interesting pizzas! Hope you do, as well. Personal pizzas that can be eaten with a fork! Preheat oven to 350 degrees F. Coat 4 ramekin bowls with cooking spray and set aside. Cut the pizza crust dough into four equal pieces and press into prepared bowls. To ensure the crusts will be cooked through, press down on the bottoms with your fingers so the dough is a bit thinner than the sides. Divide the pizza sauce, toppings and cheese between the four dishes and place on a baking sheet. Bake in the preheated oven for 15-20 minutes, or until crust is cooked through (the fewer toppings, the less cooking time will be needed). Serve warm with a fork!